Around this time of the year, many of us begin thinking about New Year’s resolutions – those promises we make to ourselves with every intention of following through. Santander Consumer USA hopes that your resolutions include some safe-driving promises that you can keep during the time you spend on the road in 2015 in your car, truck or SUV. To help you focus on the right things, we have come up with an infographic offering a dozen of our favorite New Year’s resolutions, which are good any time of the year. 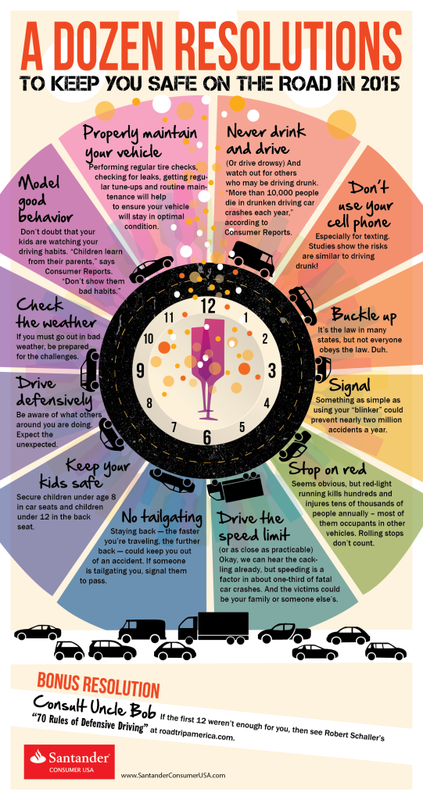 Keeping these resolutions will make you a better driver and keep your family safer on the road. Santander Consumer USA knows that most of these resolutions will sound familiar, but that doesn’t make them less relevant, and they can go a long way toward increasing your driving safety in 2015.